Innovation seems to be a buzzword today in many companies. But is it really that easy to implement a culture of innovation? So what might have been the reason that Lt. Sims didn’t have success in the first place? And there are a lot of other reason. The surprising thing is that most of these reason are still the reasons used today that innovation doesn’t function in an organisation. So what are the learning for today’s managers? Especially the last point is challenging. Stability and consistency are also needed for a successful business. But both are killer for innovations – so the right balance must be found. Mostly well established companies have some innovative ideas but are unable to integrate them into a business model. Take Kodak as an example, it had several patent for digital photography but was unable to put it into a new business model. So for example one third of the firms in the Fortune 500in 1970 no longer existed in 1983. Just because most of them could capitalise their innovations. So which are the factors for innovation in an organisation? 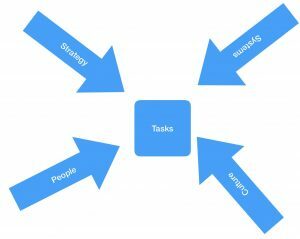 An organisation has to focus on their critical tasks to achieve the goals. So what are the factors that are influencing these tasks? So if an organisation want to implement or capitalise an innovation, it has to adept their tasks. And this means, strategy, people, culture and system must fit to it. So the question is, if these four factors fit to it. The challenge is, that if everything fits or was made fitting, it just stay flexible. Otherwise, when the next change is coming, the organisation is one again frozen.